J2 Solutions, Inc., a leading technology services firm, has been recognized as one of Philadelphia’s fastest growing companies. This is the first time J2, listed at #9, has made the Philadelphia 100 list. Conducted by the Wharton Small Business Development Center, The Entrepreneurs’ Forum of Greater Philadelphia, and the Philadelphia Business Journal, this prestigious list identifies and honors the 100 fastest growing, privately held companies that form the backbone of the greater Philadelphia region’s economy. 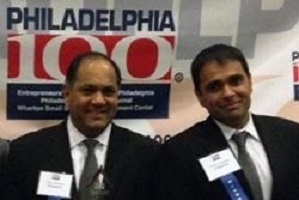 “To be recognized as a top 10 growth firm by the Philadelphia business community for our progress and technology industry leadership is a tremendous accolade,” said Vijay Khatnani, co-founder and managing partner of J2 Solutions, Inc. “This prestigious award acknowledges J2’s commitment to delivering highly efficient IT solutions that help our clients grow their business and achieve their goals. Our partnership with our clients and our dedicated employees are the driving force behind the rapid growth of the company,” he added. A hallmark of entrepreneurial achievement in the region since 1988, the Philadelphia 100 list has recognized select firms as they have begun to emerge as industry leaders. Only companies that are among the fastest growing, privately held companies are awarded the Philadelphia 100 designation. The integrity of the process and its resulting list makes the Philadelphia 100 one of the most sought after awards in the region. J2’s rank was announced at the 26th Annual Philadelphia 100 Awards ceremony, held Oct. 16, 2014 at the Annenberg Center for the Performing Arts, Philadelphia.